The City of Erlanger has created some Christmas magic and hopes to start a traditions as it invites people to come to the city building to see the new train display. Model trains and Christmas have been irrevocably linked for decades, and children have been fascinated by the powerful engines and working mechanisms for just as long. Even in the age of computers and smart phones most children's eyes light up when they see the locomotive steaming and chugging around the miniature countryside. 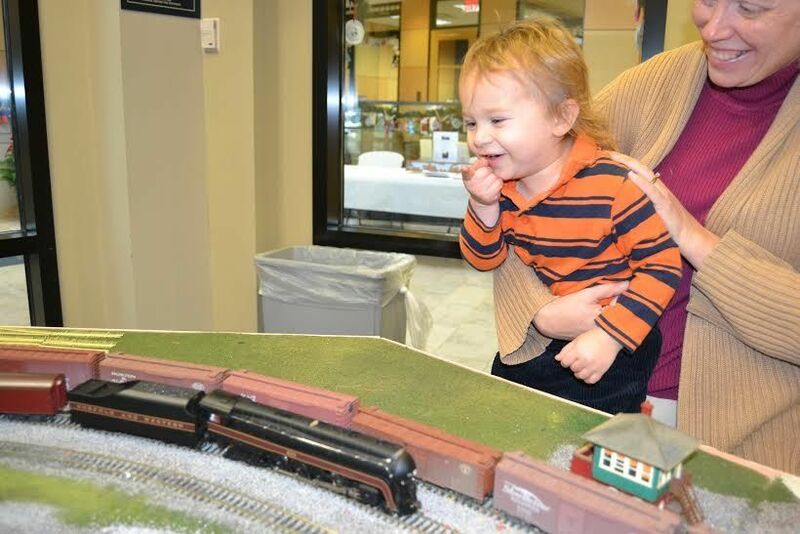 "I was sitting and talking to Paul Gronefeld, and he is a train enthusiast, so we were discussing trains and the idea came up to set up some trains here at the city building," said Erlanger Mayor Tyson Hermes. "We did a little research and found Andrew Wartman and his business American Eagle Railroad Group, in Ludlow, and he agreed to do a nice train set up for us." 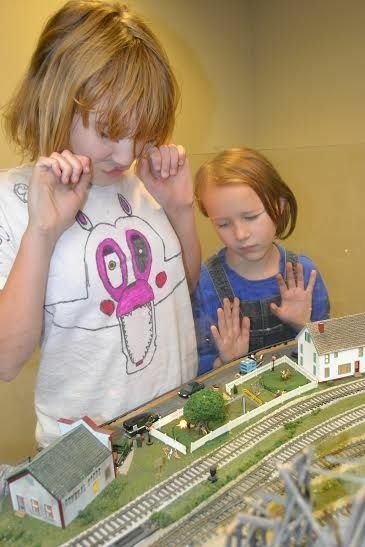 The train exhibit started last Friday and runs through the end of the year at the city building. Children can stroll around the large train table while Wartman and his partner Tom Wendt keep three full trains running on over 100 feet of track, not to mention dozens of working animations, like a merry-­go­-round, cable cars, a mining car, a tire swing, and a teeter-­totter, to list a few. Just to make it interesting, Wartman and Wendt have listed 50 hidden objects constituting a treasure hunt for adults and children to find. "This is a good sized train display," said Andrew, who works as a medic for a private company during the day, and for himself and his trains other times. "If we were to build this entire display, it would cost us $20,000 to $25,000. We were able to acquire two whole sections of the setup from the late Jim Kemper's collection, and we put it with other sections that we had. We don't use transformers any more­­­that is something that used to intimidate amateur railroad enthusiasts, the old way of using transformers and having to wire the entire train board. We use something called DCC, or Digital Control Command, which is basically a plug and play system. It is an expensive hobby, but it is still fascinating." Andrew has been interested in trains since he was a boy. He frequented Johnny's Toy Shop Hobby store, which was run by Tom Wendt's parents, so the two boys became friends­­ lasting friends with trains in common. They both belonged to the Greater Cincinnati Model Railroad Association until the real world intervened and they both had to get real jobs. "They say if you find something you love to do, you will never work another day in your life," Andrew explained. "Well, we found what we loved, but we had to change it, and make it a business so we could continue to play with trains. Our business is in the old Duro building at 319 Linden street in Ludlow, and we have trains set up there, too." The engines of the trains set up in Erlanger were chosen with care. "Two of the engines, the replicas of the 611 and the 1218, were trains that ran through here, for the Norfolk and Western," Wednt said. "They did excursions in the 1980's. One is now in the museum and the other is starting to do excursions again." Mayor Hermes also has memories of model trains. "I didn't have a set," he remembered. "We just put the pieces together around the Christmas tree. We had a sawmill, and a cattle company, and a bridge. My dad was an engineer, and he always talked about building a train board in the basement, one that could fold up entirely against the wall when we weren't using it. He never built it, but I think that was part of the fun, dreaming it out." While the history is fascinating, especially for a railroad town like Erlanger, there is nothing that compares with a little version of the majestic black iron horse that once criss­crossed the fledgling states of a new America and brought about civilization. That same awe-­inspiring, breath-taking experience is present in the eyes of the children who see the perfectly replicated trees and mountains and tiny cars and people doing things that they do every day. And it is inspiring for them to see something that someone else dreamed out and put on display for others to enjoy and remember. "The look on their faces, ­­­the older people remembering and the younger ones just discovering, ­­­is priceless," said Wartman. "Tom and I love to make the love of trains go on to another generation." Want to see? Check out the train on the following dates: December 18 from 5 p.m. to 8 p.m., December 19 from 10 a.m. to 3 p.m., and December 26, 28, 29, 30, and 31 from 10 a.m. to 3 p.m.